I have come across a complete set (well, I am guessing here. It is 26 Initial Caps) of the following. I have no idea what it is named, who made it, when it was made or what it is worth. I would appreciate any help with any of these questions. Also, assuming that it is probably worth more than I can afford, given whatever the forum comes up with as a value, is there anyone interested? 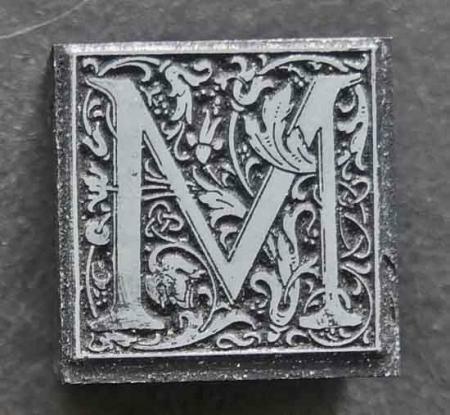 It appears to be photoengravings of Cloister initials, not foundry type, and reverse images of the original design. Wow! Y’all are FAST! I never expected an answer the next day. That’s amazing. Since it is a fairly common face I should be able to find a basic price somewhere online. Although if anyone has a price range that they are aware of, I would still appreciate hearing about it! These look a bit the worse for wear, so don’t expect top dollar vs. (for example) new monotype castings. I am new to this and there is a LOT that I don’t know. I was just re-read the answers to my question. 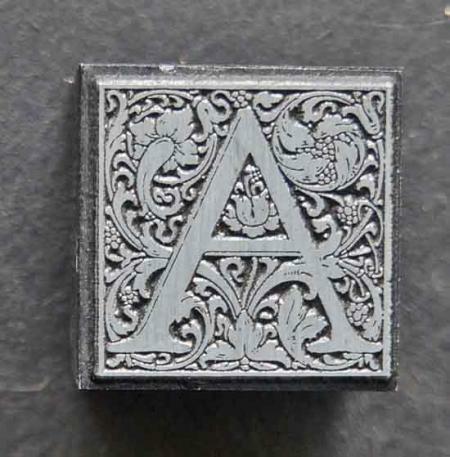 I am curious - how do you tell from these pictures that they are photo-engravings and not monotype castings. Also, how does that effect the value? Is a photo-engraving not as deep? The clue for me, aside from the appearance, was that they are reverse images (to a printer, a “reverse” is a reversal of image and non-image, not a laterally flopped image). 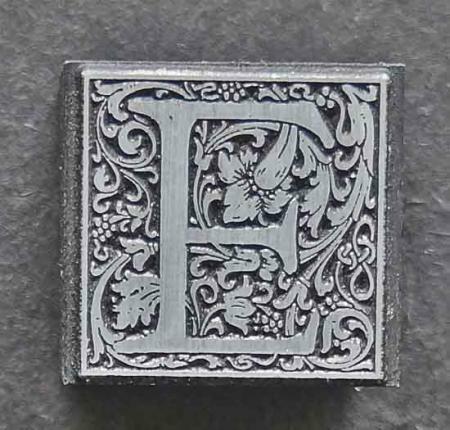 The design of this face as cast in type has the letter, the foliage and the surrounding line as white reversing out of a black square. These engravings would print those white areas in color. Another clue is the area surrounding the design. Border area varies as though an engraving was made of the whole alphabet and then sawn apart without equal margins. Cloister initials as cast fill the whole body with only slight bevel, no blank shoulder. Now, there were two-color versions of the Cloister initials but they did not color the foliage or the surrounding line. 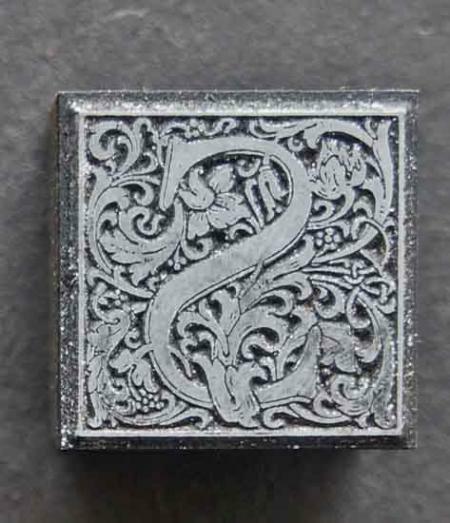 Photoengravings are often wood-mounted but could be lead-mounted too especially if intended for foil-stamping. THANK YOU parallel_imp! That was very informative. I had no idea. It turns out that the type I was looking at IS mounted on wood and is exactly what you say it is. 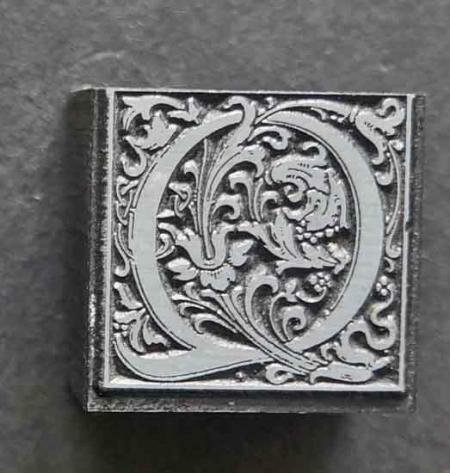 I found on-line some “true” Goudy initials with the white type and see the difference in what you are talking about. Al that said, the type that is available to me is still printable, I believe. Would you think it worth $100 for the 26 characters of the alphabet? I will probably but it even if it isn’t “the real thing” but I am hoping someone can tell me where the “stupid line” is relative to price and how much is ridiculous to spend on it.